Wheatgrass is the freshly sprouted shoots of grains of wheat. 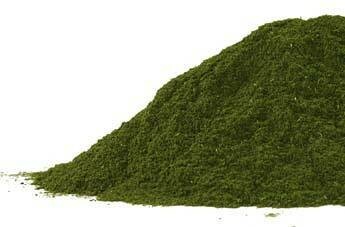 In Traditional Chinese Medicine, it is used interchangeably with barley grass. Wheat grass is grown by soaking the seeds in clean water for 6-12 hours until they sprout and grow shoots approximately 2 inches (5 cm) long. Barley grass provides a broader ranger of nutrients, but wheat grass has a superior content of antioxidants and organic phosphates. Wheatgrass sprouting seeds themselves are a wonderful addition to any diet. As above, soak the seeds for 6-12 hours, rinse the water out, and dry thoroughly. This should be repeated at least 3 times, but may be repeated more if you want your seeds to get larger. Make sure they are very dry the last round of soak/rinse as they will keep better in the refrigerator the dryer to the touch that they are. The dried unjointed leaf. In Traditional Chinese Medicine, wheat grass may be "massed" or fermented before drying. A level tablespoon (3-4 grams) of powder added to teas, smoothies, or cereals, daily. Sometimes found in encapsulations. Wheat sprouts contain a very high level of organic phosphates and a powerful cocktail of antioxidant molecules. According to research recently published in the Journal of Clinical Gastroenterology, the antioxidant activity of catalase and peroxidase appears very strong.